Is This the Best Foodie Haven in Southeast Asia? Penang is known for its food scene all throughout Southeast Asia and is considered one of the best places to travel as a foodie. As diverse as the culture is here, so is the mix of foods. The exotic mix of Chinese, Malay, and Indian cuisines make sure your taste buds are never bored. The mix of spices and flavors are unique to this island. Each cultural group here has imparted its own flavors into the food world which means you can eat a spicy Indian curry and a silky Chinese rice noodle dish all at one sitting. There are lots of nice restaurants to choose from. One of my favorite Chinese restaurants is Home Style, where a dish of fresh homemade tofu, smothered in braised eggplant, is silky and smoky and utterly sublime. You can get fried rice at every other place here but something about their version is addictive; it’s loaded with shrimp, chicken, and chives and is delicious. Another option is their clay pot chicken with basil, which is baked in a terracotta pot so the rice sticks to the bottom and gets crunchy and caramelized. Their secret sauce loaded with aromatic basil delights the palate and is so well balanced that if no one was looking, I’d probably lick the bowl. This meal is plenty for two people and comes in, without drinks, at about $9. Or, if you’re feeling fancy, go to Kebaya, where you can dine on a four-course Asian fusion tasting menu for $20 a person. There are seven appetizers to choose from including saltwater prawns with a spicy coriander sauce. For mains you have another seven choices. Even if you’re full, you won’t be able to resist the dessert. Again, there are plenty of options, but the decadent warm and oozy chocolate cake or luscious creme brulee get my vote. 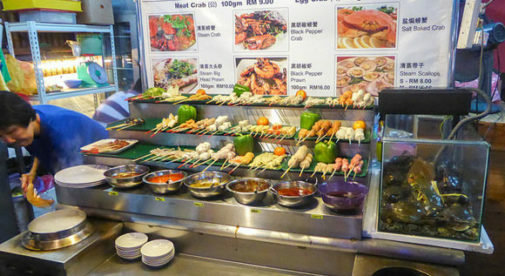 In Penang, most of the best food comes directly off a food cart or in a hawker stall. Sometimes the carts have a bicycle attached to it so they can pedal it into place daily. 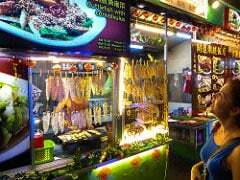 Penang, Malaysia is still considered one of the best places to travel to if you’re a foodie and the many delicious street vendors won’t disappoint. I found my favorite char kway teow cart by accident. I was driving down the road and saw a food cart with a long line; I knew it had to be good so, of course, I pulled over. This scrumptious Chinese noodle dish is to Penang what pad thai is to Thailand: almost like a food group. It’s a silky rice noodle, cooked with soy sauce, chili, shrimp, chives, egg, and bean sprouts, plus my favorite addition of thinly sliced Chinese dried sausage. It’s all wok-fried, over a charcoal flame, in about two minutes to absolute perfection and served on a banana leaf for that extra fragrant detail. The whole plate costs less than $1 so splurge and get two, you won’t be sorry. The best place to appease your taste buds is at a hawker center where you can try lots of different dishes, most for less than $5.50. These centers are found all throughout Malaysia. Imagine a food court in a mall but with food that is freshly cooked on the spot before you, creating smells that make you want to sample everything. The key is to take your time and do the rounds, look at the posted menu or pictures, and see what’s cooking. See what the locals are eating, and if it looks good, ask them what it is and where they got it. Living in Penang has opened up my eyes to a wonderful world of flavors that I just can’t seem to get enough of.